Dr Guenther sets out the work in a presentation on 3rd April at the European Week of Astronomy and Space Science in Liverpool. 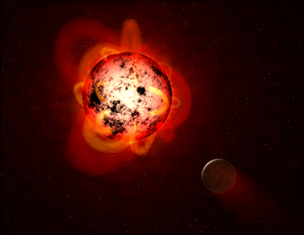 Artist’s impression of a red dwarf star orbited by an exoplanet. Credit: NASA/ESA/G. Bacon (STScI). Click for a full size imageAstronomers now know of around 4000 planets in orbit around other stars. A handful of these are both Earth-sized and in the habitable zones of the stars they orbit, where the temperature is right for liquid water. But many candidate Earth-sized worlds are in orbit around red dwarf stars, much smaller and cooler than our own. To be in the habitable zone, the planets need to be much closer to their stars than we are to the Sun. The problem, however, is that red dwarfs can produce significant X-ray emission, and often have large flares of radiation and eruptions of particles in so-called coronal mass ejections (CMEs). To try to assess the risk, Guenther and his collaborators are intensively monitoring low-mass stars where flares might take place. In February 2018, they observed a giant flare from the star AD Leo, located 16 light years away in the constellation of Leo. AD Leo has a giant planet orbiting 3 million kilometres away (fifty times closer than the Earth to the Sun), and it may have Earth-sized worlds further out in its habitable zone. The astronomers are working to establish what the flare did to the known giant planet and any hypothetical planets further out. Their initial results suggest the giant planet was unaffected, and that unlike similar events on the Sun, the radiation flare was not accompanied by a CME. This is potentially good news for life further out, as CMEs are thought to have a role in stripping away the atmosphere of smaller planets. From their monitoring, the team believe CMEs are generally less common in smaller stars. On the other hand, the X-ray radiation is dangerous. According to Guenther’s team, these would cut through the atmosphere and reach the surface of an Earth-like planet. Life on land would be badly affected by a stellar flare and might only survive in the oceans. The next stage for the research group is to refine the details of their model. Some scientists suggest that giant radiation flares could deplete the ozone layer of a planet by 94% for two years and could even be fatal for all life. If they are right, then talk of ‘Earth 2.0’ may be premature.